When we insult each other, we damage relationships and make achieving our shared goals more difficult. We recognize this, and that's one reason why we accept constraints on direct verbal insults. Yet, sometimes the urge to insult does prevail, and we've created or learned numerous ways to hurt each other without words. 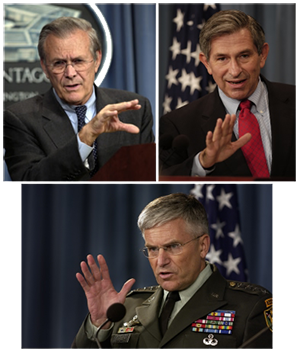 Then Secretary of Defense Donald Rumsfeld, then Deputy Secretary of Defense Paul Wolfowitz, and General George Casey, all at respective news conferences. The photos are unremarkable except for the similarity of their gestures, which could be experienced as, "Hold it right there, pal." Photos courtesy U.S. Department of Defense. Like language, humor, and most customs, dismissive gestures vary from culture to culture. While the meanings of various gestures are intuitively clear in your own culture, they can be mysteriously unfathomable in the cultures of others. And they slowly evolve with time. So beware — the items below are based on my own observations in the mainstream US in this first decade of the 21st century. By examining these tactics, we can take some of the sting out of them, and at the same time reduce the urge to use them ourselves. To that end I offer Part I of my little collection of dismissive gestures. See "Dismissive Gestures: II," Point Lookout for March 28, 2007, for more. In a meeting, tossing your copy of the handout, agenda, or report onto the conference table can communicate disdain, especially if you give it a little spin as you toss. Walking out of a meeting, abruptly and without any serious attempt to appear invisible, can communicate anger or disgust. When one listener looks at another with a heavy-lidded glance, and possibly a tilt of the head, the message is, "Gimme a break," or "She's gotta be kidding." A heavy sigh, sometimes combined with an exaggerated lift of the shoulders, can mean, "I've had enough of this trash." Typically, eye rolling is executed out of the awareness of the target, and that's bad enough. But sometimes we do it face-to-face, and then it's especially stinging. Distracted grooming can be flicking or brushing off tiny particles from your own clothing, or from a male's clothing (by a female). The flicking or brushing-off is a rejection gesture, which adds a metaphorical boost. Checking the time can be interpreted as "I wish this boring fool would give it a rest." A shrug communicates, "I don't care." For extra punch, combine with a facial expression of boredom or disdain. There are laughs-with, and laughs-at. The disgusted laugh is a laugh-at, and there's nothing funny about it. At a meeting, this action can communicate, "I have something much more worthwhile to do than to listen to this (drivel)." It's deniable, of course. Would you like to see your comments posted here? rbrenrpiNMrCDYZyslEfaner@ChacYBVztCCaBXGBCeYLoCanyon.comSend me your comments by email, or by Web form. I offer email and telephone coaching at both corporate and individual rates. Contact Rick for details at rbrenwcZjnmHfwCmxMFKcner@ChacMFWDBvMMIQXQPLbHoCanyon.com or (650) 787-6475, or toll-free in the continental US at (866) 378-5470.